This chapter introduces inference methods based on the models presented in previous chapters. We discuss samplers, which are required for hypothesis testing and posterior sampling. After a brief introduction of Markov chain Monte Carlo (MCMC) samplers from A-hypergeometric distributions discussed in Chap. 3, we introduce a direct sampler, which allows us to draw independent samples directly from the target distribution. Gibbs partitions introduced in Chap. 2 and further discussed in Chap. 4 are related to A-hypergeometric distributions of two-rows matrices. 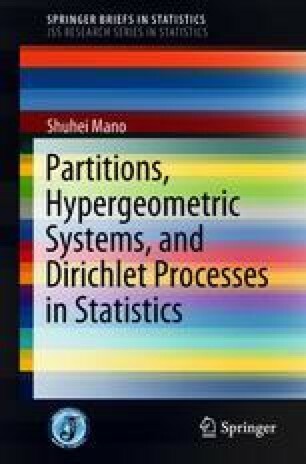 We present some interesting topics on samplers from random partitions, including mixing assessment in terms of symmetric functions and construction of direct samplers by simulating stochastic processes on partitions. Finally, aided by information geometry, we discuss maximum likelihood estimation of curved exponential families, which arise in parameterization of the variables of A-hypergeometric distributions.